Airing My Laundry, One Post At A Time...: It's Clean! She decided it would be appropriate to pull out every toy she owned. Even the ones in the closet. Anyway, I made her clean. And her version of cleaning is pushing everything into the corner and then jumping on the pile. I helped her clean. I know some people were all, “Go in there with trash bags and don’t let her have her toys back for awhile!” But that sounded like more work for me. I mean, going in and filling bags with toys? And then lugging said toys downstairs into the garage? No. It’s too hot. I did explain that we don’t pull out everything we own just because we can. I did make her put the toys she didn’t play with anymore in a box so we could drop it off at Goodwill. “Not even Rapunzel stuff?” Natalie asked, eyes wide. Mind you, it won’t stay this way for long. But it’s nice to be able to walk in and not feel like I’m in an episode of Hoarders. LOL - my upstairs is looking like I'm in an episode of Hoarders. I'm in the middle of moving the rooms around. Wow, it looks great! It amazes me how quickly kids can make a mess. Well, mine anyways. My daughter's room looks like the before photo right now. We're working on the after photo now. Fantastic job! It looks beautiful!! Well she sure can make a giant pile o' stuff. Ha. Happy to see all is back to normal. Glad it got all put back together. I liked how you handled the situation. Natalie is so cute! Haha, love that she pushes everything into a corner then jumps. My boys rooms never look like that last photo! 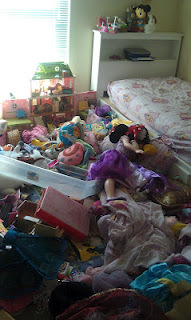 My girls usually keep their rooms pretty clean. But that is only because they only use them to sleep in. Now, my basement - that is a whole 'nother story. My youngest has even put things under the throw rugs. AS if I wouldn't notice the lumps. Under the sofas is also a breeding ground for little pieces. Every once in a while I'll go through and have a melt down of my own about it's disastrous state - and then it will return to it's regular bit of chaos. Wow it looks great! Fingers crossed it lasts longer than usual. My children do that to our basement and I too make them clean it but which in their minds is worse then having baboon shoots under their fingernails. I've completely given up on Dracen's room ever having any sort of order to it. It's just too overwhelming. OMG! 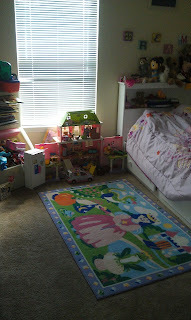 My 18 year old stepdaughter's room is so bad that I think the health department would condemn the house if it was seen. I told my DH to tell her to clean it to my standards (very important detail) in the next 24 hours or she won't like it when I tell her! Simply no excuse for this. It is different with your little one though. You have years to work with her on this! Natalie has such a cute room! Wow looks good and you got rid of a few things plus she probably rediscovered a few toys she forgot about! Have a great day! LOL...I am laughing right now. Because my 20 year who still lives at home...his room looked similar. Only his toys were snow gear (not in use) clothing (I am pretty sure every piece he owns), candy, gaming stuff all covered his floor. I have not been brave enough to post about it yet. My kids' room generally looks like (picture A + picture B)/2. I think. That high school and college math is really working out for me. Who am I kidding? I didn't take math in college!